With all of the elements involved, SUP board, water, wind, etc., you will find that your mind cannot run off to your to-do list. It truly tests and improves your patience, as you have to slow down and really experience every move you make. You may or may not fall off your board at any point, depending on how daring you are in your fullest expression of each posture! Come with an open heart, an open mind, a smile and expect to have a lot of fun. To see a calendar of events & classes click here! Each class offered to the public is a beginners class. However, no matter how many years you have been practicing yoga, it is a whole different experience and very challenging! Through original hatha yoga asanas, you can go as deep as you like into each posture. As your practice evolves, you become more connected and comfortable, allowing you to explore more and more! We also offer custom classes for those who want more! Whether you’re new to the sport of stand up paddle boarding or already an expert, having upper body and core strength will add endurance and balance to give you extra confidence. Join our certified instructors for a fun, non-judgmental SUP Fitness class! You will enjoy a 60 minute class filled with Yoga, Strength and Cardio. We create an uplifting atmosphere that will leave you feeling challenged and inspired. Enjoy a peaceful pool as you practice yoga on the water. 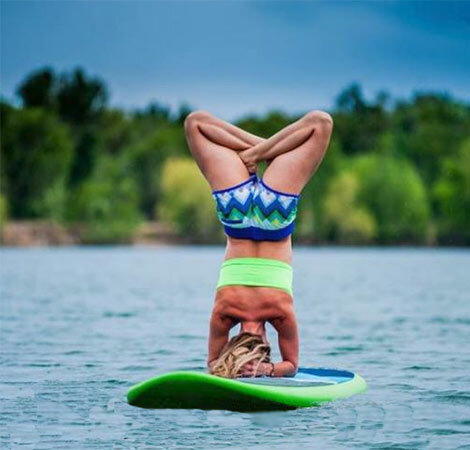 ACA Certified SUP instructors from Idaho River Sportsd will help you take Yoga to the next level with SUP Yoga. Classes emphasize breathing, focus, control and flexibility. This should not be your first yoga experience. SUP boards are provided and you must be 16 years of age or older and a *green ribbon swim test is required. Registration is through the Treasure Valley Family YMCA. SUP offers a complete workout and is a great activity for lakes, rivers and the ocean. In the SUP Intro class you'll learn the proper stance for balance and control, basic paddle strokes and techniques from American Canoe Association (ACA) certified instructors. We'll also give you tips on selecting the right board and paddle for your size and paddling style. Intro courses are held on Quinn's Pond and Esther Simplot Pond. No experience is necessary. Idaho River Sports also offers special clinics with some of the world's best stand up paddleboarders. Champions like Dan Gavere, Britanny Parker and Michael Tavares have made Boise a stop on their tours because of the hospitality of the team at Idaho River Sports.